Following the end of World War One residents in Brierley Hill wished to erect a war memorial. A design was chosen and the ex-servicemen’s association was asked who should model for photographs from which the sculpture was designed. They chose Stanley Harvey, the first Brierley Hill man to win the Distinguished Conduct Medal in the war. “16370 Pte, (acting L./Cpl.) F.H.S. Harley, Worcs. R.
Amongst those mentioned in last Friday’s “London Gazette” as having been awarded the Distinguished Conduct Medal is Lt Cpl F.H. Stanley Harley, Worcestershire Regiment, son of Mrs Murray, and stepson of Mr Charles Murray, 9, Hill Street, Brierley Hill. we understand the act of gallantry which gained Lance Cpl Harley the honour occurred in our attack on March 12 last. He was in charge of two guns. Upon the battalion reaching their objective all his team were wounded, and he was left alone; but though under very heavy German shellfire, he succeeded in bringing the guns safely through. The lance Cpl is an old boy of Bent Street Council Schools. 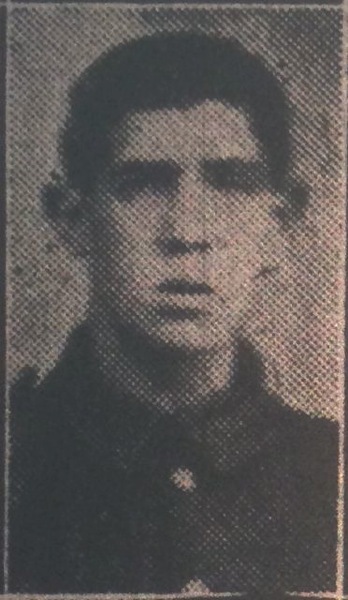 He enlisted on September 2, 1914, when only 16 years of age, and will not be 19 until next July. He expects to come home shortly, and we understand arrangements are being made to publicly recognise the honour he has brought to his native town. Before joining the colours he was employed at the Earl of Dudley’s Round Oak Works. L-Cpl Stanley Harley, son of Mrs Murray, and stepson of Mr Charles Murray, of Hill Street, Brierley Hill, was the first Brierley Hill man to receive the DCM decoration. He arrived home last weekend on a 10 days leave, and as the time was too short to enable the town authority to arrange for a public reception, they decided to invite the soldier to Monday’s meeting of the Urban Council, so that the chairman (Mr AE Marsh) might, in the name of the town, congratulate him upon the distinguished honour he had won. L-Cpl Harvey was accompanied by Mr Murray, and on entering the Council Chamber received a very hearty welcome. The Chairman said he had a very pleasant duty to perform. They were met to congratulate L-Cpl Stanley Harley, of the Worcestershire Regiment, who had recently received the DCM for a very brave, brilliant, and gallant episode, of which he was the hero, and which occurred on March 4th last-(hear, hear). Although all the men who were with him were killed, Harley, at great personal risk, took charge of two Lewis guns and brought them out of action safely-(hear, hear). It was a very brave and courageous act, and well merited the signal honour which has been conferred upon him-(hear, hear). Mr G Fred James (vice chairman) said he would like to associate himself with the appreciate reading remarks from the chair. L-Cpl Harley was a hero indeed-(hear, hear). Few of them three years ago thought the war would be on now. During that time anxiety is had crowded upon them. Many of the people of Brierley Hill has lost their dearest and best. The papers has been almost daily filled with the stories of horrors perpetrated by a faux unequalled insanitary in the history of the world. But although they had had their terrible happenings, they had on the other hand read of actions which had gladdened their hearts. The bravery of our men was worthy of the most distinguished honours; they were heroes indeed. And what has pleased their most was the fact that Brierley Hill boys were among them – (hear, hear). The Staffords and the Worcester’s has distinguished themselves on many occasions, and he hopes that the time was not far distant when the town might welcome back all those brave lads who have so faithfully fought our cause in foreign lands-(hear, hear). Although many have distinguished themselves, perhaps when the records of the regiments came to be written they would hear something about individual doings. In the meantime we all prayed that the war might be quickly over, so that we might have the pleasure of welcoming back our brave lads. Perhaps when the proper time pain they would be able to give their heroes are more public welcome-(hear, hear). Mr T Williams said he has known Harley’s family for many years. Brierley Hill was very proud of him-(hear, hear). Many other Brierley Hill lads had won distinctions. Several have been decorated with Militarily Medals, and he thought it was up to the Council and the town to see that these heroes were properly recognised. He thought steps should be taken almost immediately to show that the town appreciated the honours which the men had brought to it-(hear, hear). L-Cpl Harley, who was warmly received, thanked the Council for their congratulation, and the chairman of his very nice present. The lads of the Black Country were all doing their bit to bring glory to their native towns-(hear, hear). He was unable to give his experiences publicly, but he would be glad and proud to tell the story of how he won the DCM to any of the members of the Council should they care to hear it-(hear, hear). As to the probable length of the war, he thought that the next three years would see the finish of it -(laughter). The Chairman said he would very much like to hear Harley related his experiences. He added that there had not been time to have an inscription engraved on the watch, but this would be done later.